Not to be confused with Koine Greek. "Koiné" redirects here. For other uses, see Koine (disambiguation). 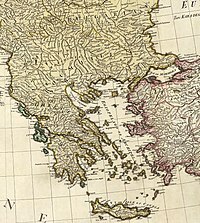 Despite their different dialects, koineization in Ancient Greece enabled the various Greek political entities to maintain commercial and diplomatic relations. In linguistics, a koiné language, koiné dialect, or simply koiné (Ancient Greek κοινή, "common [language]") is a standard language or dialect that has arisen as a result of contact between two or more mutually intelligible varieties (dialects) of the same language. Since speakers already understood one another from before the advent of the koiné, the koineization process is not as drastic as pidginization and creolization. Unlike pidginization and creolization, there is no "target" within Koine formation. It involves continuity in that speakers do not need to abandon their own linguistic varieties. Normal influence between neighbouring dialects is not regarded as koineization. A koiné variety emerges as a new spoken variety in addition to the originating dialects; it does not change any existing dialect. That separates koineization from normal evolution of dialects. Koiné Greek then went on to become the language of the Macedonian empire, and was widely used as a second language (though it did have some native speakers). The term koine (meaning "common" in Greek) was first used to refer to the form of Greek used as a lingua franca during the Hellenistic and Roman periods. It arose as a mixed vernacular among ordinary people in the Peiraieus, the seaport of Athens, which was inhabited by Greeks from different parts of the Mediterranean. Through koineization, new dialect varieties are brought about as a result of contact between speakers of mutually intelligible varieties of that language. Koineization is a particular case of dialect contact and how it typically occurs in new settlements to which people have migrated from different parts of a single language area. Koineization typically takes two or three generations to complete, though it can be achievable within the first generation. Language variation is systematic, in that it can be related to social divisions within a community, such as class and gender. Change can be shown to originate with particular social groups based on these divisions. However, a number of linguists have recently argued that language change lies with the individual. A regional koiné is formed when a strong regional dialect comes into contact with dialects of speakers who move into the region. Often the use of the koiné spreads beyond the region where it was formed. The original koiné was of the regional variety. It was based on the Attic Greek dialect that underwent a koineization process when it came into contact with other Greek dialects spoken in the Athenian seaport Piraeus and ultimately became the lingua franca of the Hellenistic world. An immigrant koiné is a new dialect that forms in a community settled by immigrants speaking two or more mutually intelligible dialects of the same language. In the late 19th and early 20th century, speakers of a variety of Hindi dialects were conscripted to serve as indentured laborers throughout the colonial world. Speakers of these dialects came together in varying proportions under different conditions and developed distinctive Hindi koinés. These Hindi/Bhojpuri dialects are found in Fiji, Guyana, Mauritius, South Africa, Suriname, and Trinidad and Tobago. Kerswill also examines the Norwegian dialects that emerged in two towns which were located around smelters built at the head of the Sørfjord branch of the Hardangerfjord in the mid-twentieth century. The towns, Odda and Tyssedal, both drew migrants from different parts of Norway. The workers in Odda came predominantly (86%) from western Norway. In Tyssedal only about one-third came from western Norway; a third came from eastern Norway; and the rest from other parts of the country. The dialects that evolved in these two towns were thus very different from each other. Peter Trudgill sees three processes in operation during what Mesthrie calls the accommodation period: mixing, levelling and simplification. The processes of leveling and simplification are both dependent on a wide range of factors, including the differential prestige related of the contributing dialects, socio-political contexts in which the new dialect develops, and individual networks of adults involved in the accommodation process. Additionally, both Trudgill and Mesthrie also comment on the process of reallocation, in which features that have been retained from contributing dialects take on new meanings or functions within the new dialect. Trudgill posits a multi-generational model of the development of a koiné. During the first (i.e., immigrant) generation, the speakers of the contributing dialects mix, and there is some leveling. The first native-born generation of speakers continues the leveling process. However, in the instances Trudgill was able to document (e.g., first generation speakers of Tyssedal and Odda dialects of Norwegian), the speech of this generation still reflected considerable variability in use of marked forms, both between speakers and in the repertoire of individual speakers. It is the third generation that focuses the variations and stabilizes the dialect. Trudgill admits that there are cases where the focusing can take place in the first generation of native-born speakers and also instances where it might be in the fourth or even later generations. The dialect in its emerging state, a state marked by heterogeneity of forms, Trudgill calls interdialect, often called an interlanguage in other dialect studies. Australian English, a dialect which initially emerged as a mixture of eighteenth century Cockney English and Irish English, and was subsequently influenced to some degree by Received Pronunciation in the nineteenth century. Central Asian Korean (Koryo-mar), based on Yukjin dialect and multiple other varieties of Northeastern Korean. Iraqi Koiné, a variety of Assyrian Neo-Aramaic based on the various mountain dialects in Turkey and Northern Iraq (i.e. Tyari, Jilu, Nochiya, etc.) under the influence of the standard Urmežnaya variety (in Iran). In layman's terms, this dialect is a compromise between the thicker "low-class" accents of the mountains (i.e. Tyari) and the prestigious "posh" dialect of Urmia. Iraqi Koine was developed in the urban areas of Iraq (i.e. Baghdad, Basra, Habbaniya and Kirkuk), where the Assyrians immigrated to. London accent, a dialect primarily based on RP English whilst having some influences of the southern England dialects (i.e., Cockney, Kentish, Estuary). The dialect would slightly vary, depending on the speaker, where some would tend to sound more "RP" whilst others would be on the "working class" side. Essentially, this dialect is modernised RP with a touch of the aforementioned urban dialects in Southern England. Notable people who have this accent include Orlando Bloom, Keira Knightley, Daniel Radcliffe, Kate Winslet, Tom Hardy, Jude Law, Emma Watson and Gary Oldman. Poetic Koiné of Old Arabic and Classical Arabic. Shanghainese, a dialect of Wu Chinese. It is essentially based on the Suzhou dialect, while influenced by Mandarin Chinese, English and other Wu Chinese dialects, especially the Ningbo dialect. It has been understood as a lingua franca throughout the late 19th century and into the early 20th century Jiangnan, replacing the Suzhou dialect as the lingua franca. It was then replaced by Mandarin. Other Wu Chinese dialects, particularly the other Taihu Wu dialects, are now being further koineized into a common Wu Chinese language, at the expense of dialectal diversity, as their newer pronunciations and phonology resembles that of Shanghainese with each generation. Dano-Norwegian, the basis of Norway's most widely used written standard, Bokmål. Koiné Greek, the language that has given name to the general phenomenon. N'Ko, which is both a script and an emerging literary version of the Manding languages. ^ For example: Campbell, John Howland; Schopf, J. William, eds. (1994). Creative Evolution. Life Science Series. Contributor: University of California, Los Angeles. IGPP Center for the Study of Evolution and the Origin of Life. Jones & Bartlett Learning. p. 81. ISBN 9780867209617. Retrieved 2014-04-20. [...] the children of pidgin-speaking parents face a big problem, because pidgins are so rudimentary and inexpressive, poorly capable of expressing the nuances of a full range of human emotions and life situations. The first generation of such children spontaneously develops a pidgin into a more complex language termed a creole. [...] [T]he evolution of a pidgin into a creole is unconscious and spontaneous. ^ Siegel, 1985, p.358; Bubenik, 1993, Dialect contact and koineization: the case of Hellenistic Greek. ^ Thomson, 1960, The Greek language. Cambridge: W. Heffer & Sons. ^ Labov (1972), Sociolinguistic patterns. Philadelphia: Pennsylvania University Press. ^ Croft, 2000, Explaining language change: An evolutionary approach. Harlow: Longman. ^ Kerswill, P. (2002). Koineization and accommodation. In J. K. Chambers, P. Trudgill & N. Schilling-Estes (Eds. ), The handbook of language variation and change (pp. 669–702). Oxford: Blackwell. ^ (in Korean) Kwak, Chung-gu (2007). "Data and Ressarches for Korean dialect in Central Asia" (PDF). Journal of Humanities. 85: 231–272 – via Institute of Humanities. ^ A handout by John C. Wells, one of the first to write a serious description of the would-be variety. Also summarised by him here . ^ Crystal, David. "RP and its successors". BBC. Retrieved 12 April 2011. ^ Rogaliński, Paweł (2011). British Accents: Cockney, RP, Estuary English. p. 11.